Woodcraft cabinets are made the way we would make them for our own homes. Details like 3/4”shelving and doors, English-dovetailed drawer joints and European-style metal drawer glides are among the craftsmanship features most desired in cabinetry today. Plus, the advantages of real wood versus particle board, creates a cabinet that has no limitations when it comes to finishing, and is at home in the naturally moist environment of kitchens and bathrooms. 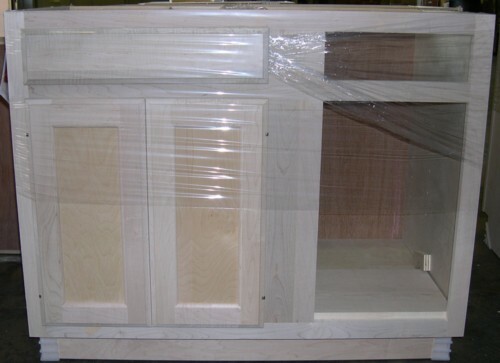 As a result, our cabinets are ready to finish and ready to install. Standard base cabinets are 34 1/2” high and 24” deep, have working drawers, one base shelf and one half-shelf. Sink bases have one base shelf and false drawer fronts. Sink fronts are fronts only, with a toe kick attached. Three-drawer base cabinets have one 3 1/4” and two 8” drawers. 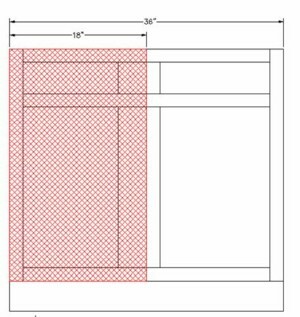 Cabinets less than 12” wide have a solid door (raised, flat panel, cathedral and arch not available). Standard vanities are 31” high and 21” deep and have false drawer fronts. Tall vanities are 34 1/2” high. Narrow (shallow) vanities are 31” or 34 1/2” high and 18” deep and have false drawer fronts. Three drawer vanities are 31”or 34 1/2” high and 21” deep, and have two 5” and one 3 1/4” drawer. 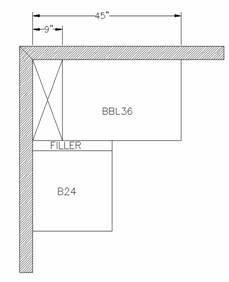 Combination vanities are 31” or 34 1/2” high and 21” deep. 30” wide and 36” wide combination vanities have two false drawer fronts, two working drawers and one door. 48”, 54” and 60” wide combination vanities have two false drawer fronts, three working drawers and two doors. 42” wide combination vanities are the same, except they only have one false drawer front. 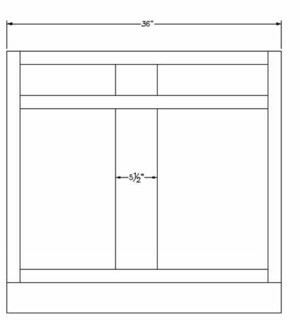 Standard wall cabinets come in 15”, 18”, 24”, 30”, 36” and 42” heights with a 12”or 15” depth. 24” high wall cabinets have one adjustable shelf. 30” and 36” high cabinets have two adjustable shelves. 42” high cabinets have three adjustable shelves. 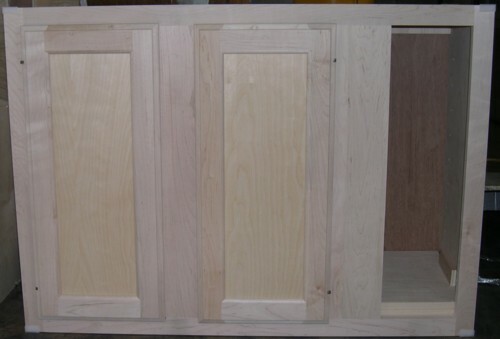 Our premium grade kitchen and bath cabinets are constructed with 1/2" thick Birch plywood sides. If a cabinet side needs to be exposed and stained, it would be advisable to select one of the side options: stain-grade side, 3/4" flush stain-grade side, or stain-grade end door. These options replace the standard Birch plywood with stain-grade plywood to match the front of your cabinets. 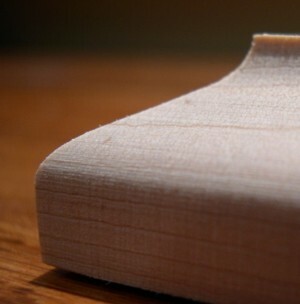 Another option is to cover the plywood sides with a 1/4" thick end panel skin or plain or beadboard material. Since the face frame of cabinets are about 1/4 of an inch wider than the sides, the end panels will make the sides look flush with the front. 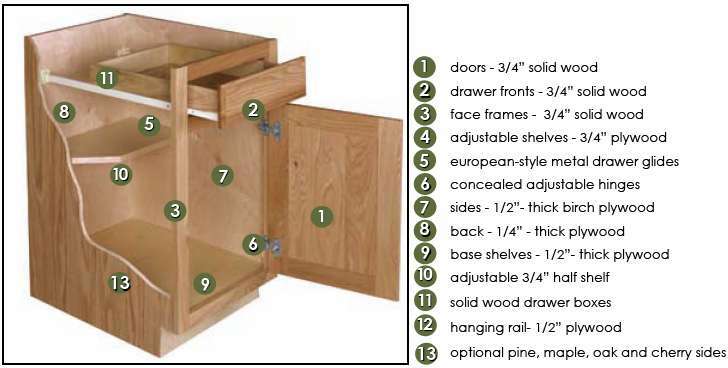 Kitchen and vanity cabinets come standard with hidden "Euro" 35mm door hinges with either a 1/2-inch overlay or a 1-1/4-inch overlay (for the full-overlay door styles). They allow the door to open 110 degrees. Doors will not come with knobs, but you can purchase knobs and pulls on our accessories page or get them from another source. 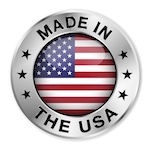 No holes will be drilled into your kitchen cabinet doors, so you can buy any style of hardware you want. 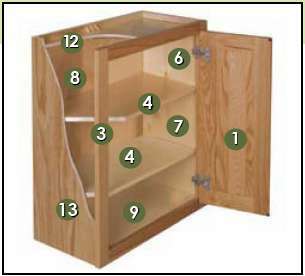 For additional choices, we recommend Rockler.com and other stores on our links page for a great selection of cabinet pulls. Kitchen cabinets with flat-panel, raised-panel, or beadboard doors have a beveled outside edge using the L-edge profile (below left). 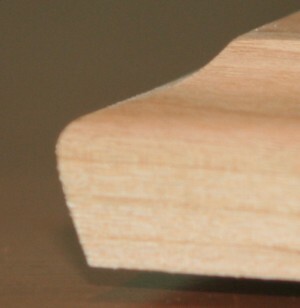 The Reverse-bevel edge is a non-standard option. 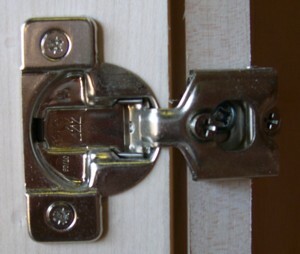 Reverse raised-panel doors appear to have flat-panels because the raised portion has been flipped to the inside or the door. Shaker doors have square edges. See the door styles page for more details. 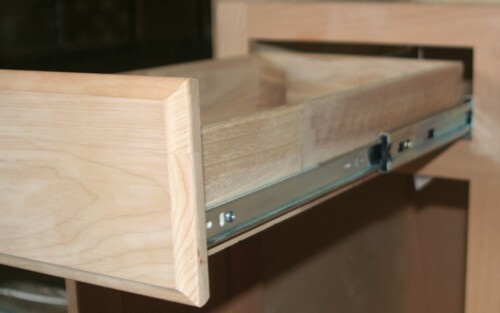 Drawer boxes feature 5/8" thick sides and English-dovetailed joints and dados, locking the bottom in place and giving each drawer added strength and durability. See the cabinet options page for more details. Wall cabinets are pre-drilled every 2-1/2" for adjustment of the 3/4" thick shelving and come standard with brass shelf pins. 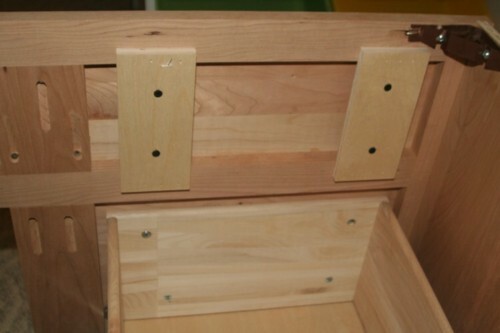 The photo below shows the front joint of a base 3-drawer kitchen cabinet where the solid wood face frame meets the plywood sides. 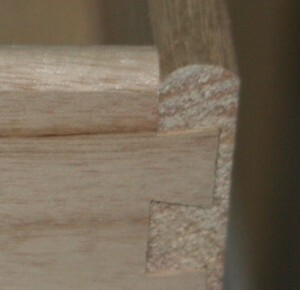 You will notice that the sides are recessed 1/4" from the face frame. You can use an end panel skin to fill in this space with stain-grade material. If you choose to have a stain-grade finished side, you get a furniture-quality grade of plywood, but it will look almost the same from the top (and will still have the 1/4" recessed area). 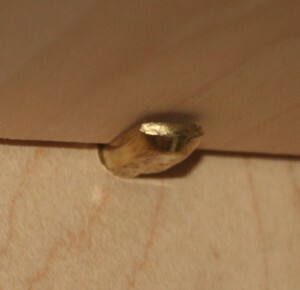 The photo below shows the back joint of a base 3-drawer kitchen cabinet with full-extension glides. The photo below shows the standard heavy-duty 75 lb load full-extension glide. Blind base cabinets need to be installed between 6-9 inches from the wall on the blind side. So, the part of the cabinet that will be hidden will only be 15-18 inches wide. The farther out you pull it from the wall, the more clearance you will have to open the door. 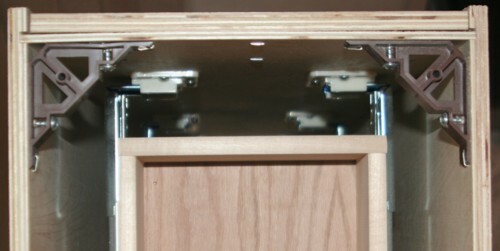 Below you can see an example of a blind base cabinet with the blind side on the right. 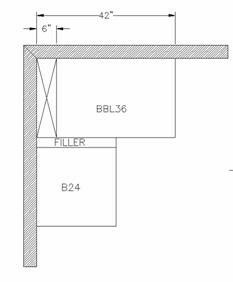 The diagram below shows that a 36"W blind base cabinet requires 42-45" of space along the wall. The filler strip is recommended if you also need additional space to open the door of an adjacent base cabinet. Blind wall cabinets can be placed between 0-3 inches from the wall on the blind side. Below you can see an example of a blind wall cabinet with the blind on the right.